Dragon playing fun for Kullerbü fans of all ages. The balls race down the spectacular dragon volcano, spin around in the ball funnel and then continue along the track at top speed. Then they pass through the cool dragon tunnel with little bell and back to the volcano – where the ball adventure starts all over again. 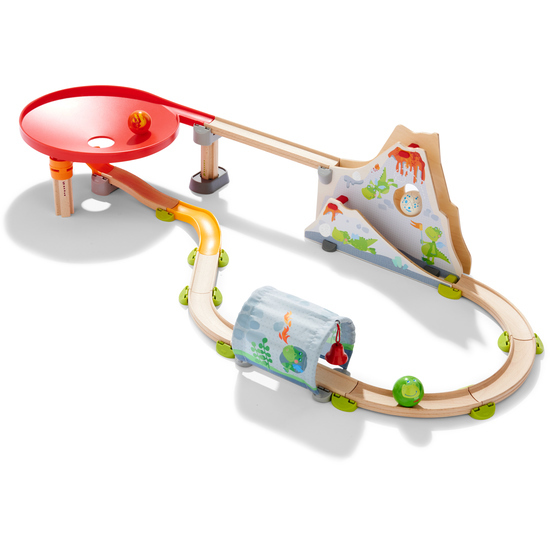 Contents: 1 dragon volcano, 1 dragon tunnel, 1 ball funnel, 4 curves, 3 straight tracks, 1 wavy curve, 1 ramp, 1 starting ramp, 3 columns, 12 connecting elements, 1 backdrop clamp, 1 dragon ball, 1 lava ball, 1 dino egg ball.